Here is my chemical-free new sofa! This post contains affiliate links to products I used. We used maple because it is a hard wood that is non-aromatic (it does not have a strong terpene smell). The stain we used was Naturhaus Harmonic, which will soon be available online. The ingredients are: beeswax, carnauba wax, shellac, and a cosmetic emulsifier. It had a very sweet smell for the first two days. Other options for stains are AFM Safecoat WaterShield or Ecos. The glue used was Titebond. The Foam is a piece of 3" natural latex. This has a natural rubber smell (which doesn't fade completely with time) but does not give off VOCs at the level of conventional foam, nor does it contain flame retardants. (I no longer recommend natural latex to sleep on and I am not sure if it is suitable for a sofa - here is my warning). Metal brackets reinforce the frame so that the side piece can be leaned on. The inspiration picture had low sides that would not be as comfy; I didn't think I'd be able to curl up on that sofa. 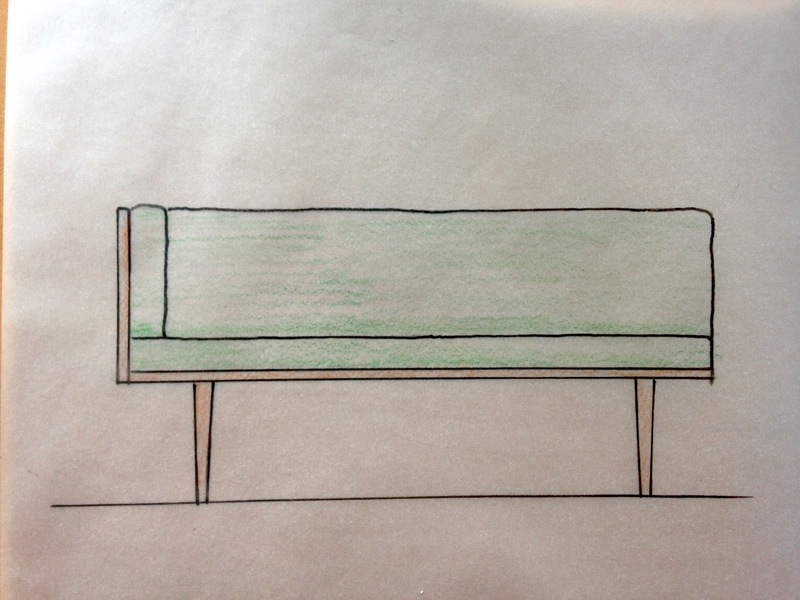 The dimensions are 28 in depth (standard sofa depth), height from seat 16 in (fairly standard), length 5 feet (length was made to fit in my tiny house). The total was around $3500. This is expensive, even for a chemical-free sofa. 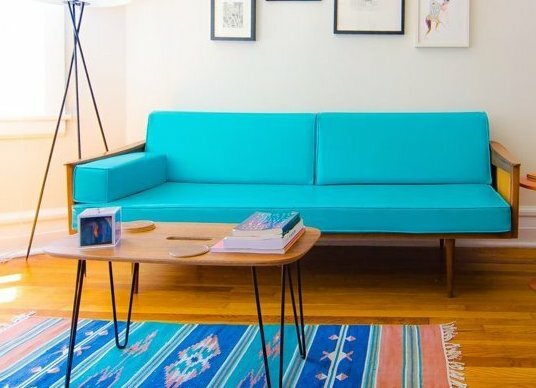 Another option is to buy a sofa from a company that makes non-toxic upholstered furniture. I have looked into and compared these companies in this post. Ammonia or unspecified curing agents are used to stabilize the rubber. By all accounts the natural latex does not offgas once it is formed. Not everyone can tolerate it however, so there could be some concern about the curing agents. 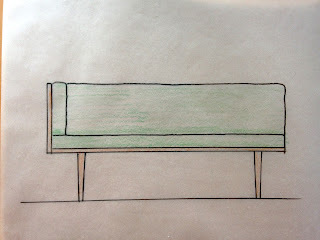 We used wool batting, minimally processed, with an organic cotton cover and another removable cover, to make a futon. Very comfy. We are careful to air it out every day or at least put it on a rack indoors. With pillows and a throw, it is very civilized as a couch or spare bed. Yes, we have become cheaper with age.